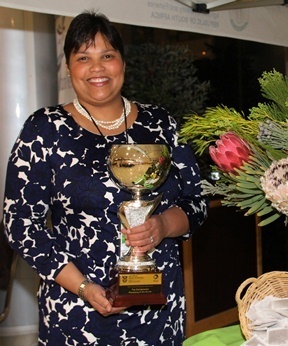 A former Boland College student and Western Cape entrepreneur clinched top honours in the Agri-processing category at the National Department of Agriculture, Forestry and Fisheries (DAFF) Awards to honour women in agriculture. Ilse Ruthford, a former Marketing student at the Stellenbosch Campus, was named one of South Africa’s best female entrepreneurs in agriculture at a gala dinner in Mafikeng in August. She went on to compete in the national awards after winning the Agri-processing category in the Western Cape leg of the DAFF awards held in Wellington. Ruthford is the financial manager of the wine storage facility at the Compagniesdrift farm which is one of the Western Cape’s land reform success stories. It is an equity scheme project where 50% of the farm is owned by the Meerlust Powerment Trust of which she is a member. The facility offers storage, bottling and labelling services to the wine industry. Currently 42 producers in the wine industry store a total of two million bottles in the warehouse. It offers a cost-effective alternative to local wine producers who do not have easy access to such facilities. Speaking after her win, Ruthford encouraged other women in the industry to pursue their goals. “Your dreams can come true too”. She said her win was a team effort, adding that the farm’s management and workers also deserved credit. She planned to establish a vegetable garden and cattle herd on the farm. “This award motivates me to do so much more. Now, I really want to see things happen,” said Ruthford. The competition – a joint effort between the National Department of Agriculture, Forestry and Fisheries and the provinces – rewards the efforts and contribution of women in matters such as food security, job creation, economic growth and poverty alleviation.